The Sri Lanka Freedom Party (SLFP) members of the Unity Government would continue to remain in it, backing SLFP Chairman and President Maithripala Sirisena, Minister S.B. 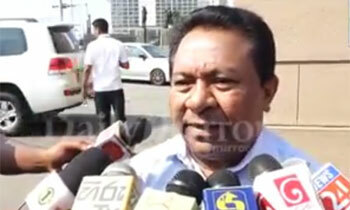 Dissanayake today said. However, he said they would continue to push for drastic changes in the government including changes in portfolios. Wait and see! If there is no majority, the rogues can come in!!! Get ready to be wiped out completely in 2020! SB should have been jailed for bribery if not for the Netticumaras sticking their neck for him.he is an out right looser and a back door entrant to parliament. He will carry anyoned sh*t buckets to remain where he is.he is an outright looser. Even during the concluded elections on the 10th.His constituents does not want him at all. Where are the slfp card board heros yesterday said show 113 in parliment and establish government?.mahinda got thieves from party and sirisena got leftover idiots and thieves both. Susil, Dayasiri, Nimal and Dilan been trapped and failed miserably. There is no good governance soon Sri Lanka will be a colony of India. Good luck for the idiots who suported UNP and President. We are lucky. You people didn't run behind the offered corruptly earned money. Would there be any difference to countries economy whoever becomes PM and Ministers among all these incompetent morons?